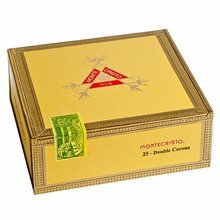 Montecristo cigars, the world's most famous cigar marquee, originated in Cuba in 1935. The tradition of Montecristo excellence continues today with skilled artisans in the Dominican Republic, and the Montecristo Churchill is a shining example of that skill. This big mild to medium-bodied smoke offers the rich, smooth, and well-balanced flavors that loyal fans of this brand have come to depend on on for many decades. 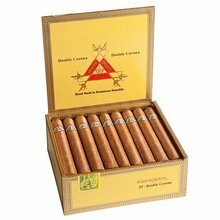 The Churchill is housed in the classic yellow dress box loaded with 25 cigars. Great choice of a cigar, usually r Prefer the sweeter ones but this will be in my humidor again soon. I enjoy this stick. Nice spice and draw with an even burn at a great price. The monte Churchill is anything you’d expect from a Monte smoke. One of my favorite houses. A great cigar for a longer duration smoke! I admittedly won't have then in the winter, but will now that cabin season is upon us! Good stick, smooth draw, and a decent taste. Will smoke it from time to time but not my go to. Looking for a cigar with a medium bodied smoke? This is it! Giant size with great taste. Very enjoyable smoke. This Cuban seed filler with a Connecticut shade wrapper was a great smoke. It had an excellent consistency. A great smoke to the very nub. Medium body stick. Good long smoke that is smooth and tasty. Construction is consistent. Buy these every so often to enjoy with a fine scotch. I've always enjoyed these with my morning cup of coffee and have recommended them to many friends who do the same now! Good smoke if you like a cigar on the milder side. To mild for my tastes so I don't get much flavor from this stick. This is a good choice for someone getting started with cigars or as a lazy morning smoke with coffee. A Churchill is a bit long for me but this is a great cigar. Montecristo’s will never disappoint.